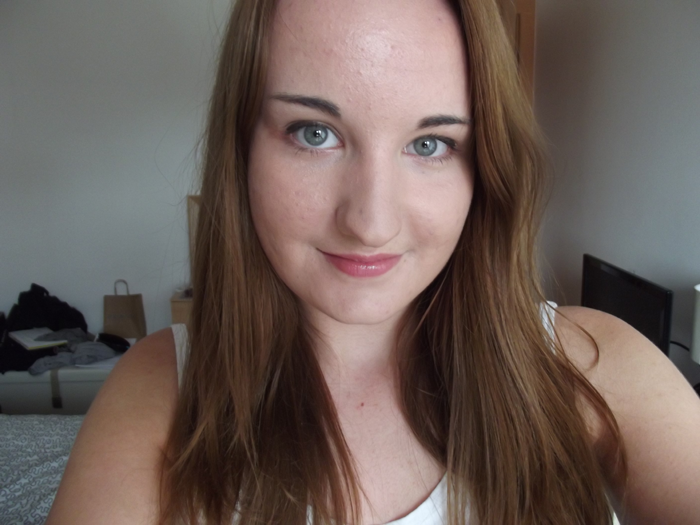 A while back, when I wrote a post on my skin care routine, AnneMarie suggested that I should share my makeup routine. So, here goes. 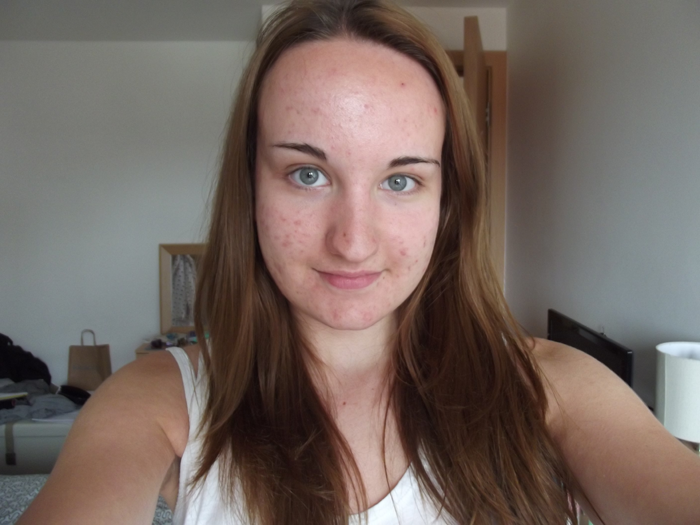 Firstly, I must point out, I don’t like wearing makeup that much. In particular, I loath foundation. However, I wear it to cover up my spots and general imperfections in my skin. But I do quite enjoy making my eyes look pretty, and I’ve recently got into wearing lip stick. I aim to make my makeup look natural, although sometimes that isn’t always easy. Before I apply my makeup I cleanse, tone and apply moisturiser, as documented in my skin care routine post. Here’s the before picture. I’m really not confident showing pictures of myself without makeup on so this is a big thing for me. My acne has improved significantly thanks to my skin care routine but I’ve still got a few scars from the spots I once had. Once the moisturiser has been absorbed I apply my foundation. I wear No.7 Stay Perfect Foundation in a Cool Ivory colour, available from Boots. If you are a non-Brit and you are interested in No.7 foundation, Amazon.com has some of their products available, but not mine specifically. 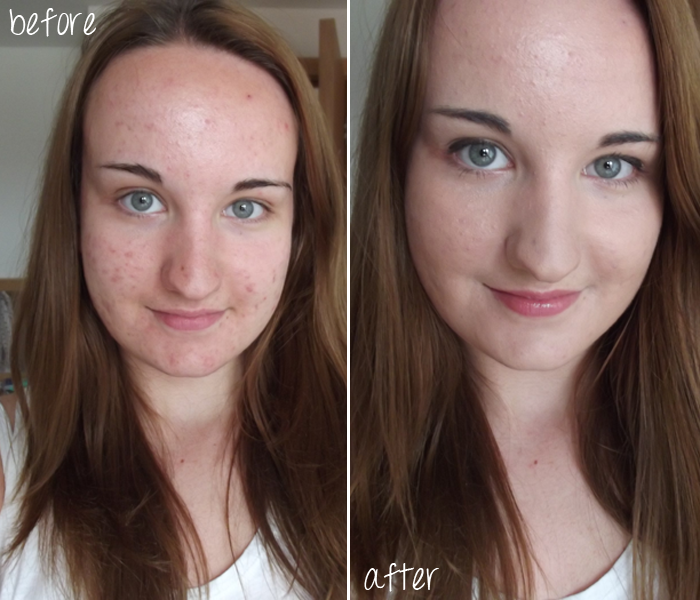 Just look how much the foundation improve the appearance of my spots! I apply my foundation lightly using a makeup sponge. It’s best to use disposable sponges to prevent a build up of bacteria on the sponge. Dirty sponges and brushes aren’t good for your skin. Next, I apply my eye liner (I do everything in a weird order). I couldn’t tell you the make of my eye liner pencil because I got free with a magazine when I was like 14! I kept it as I thought that one day I might actually use it. I’ve only been wearing eye liner for the last 6 months or so. I apply eye liner just to the outside corner of my eyes on the top lid only. I just like to highlight my eyes a little without making it look messy or obvious. 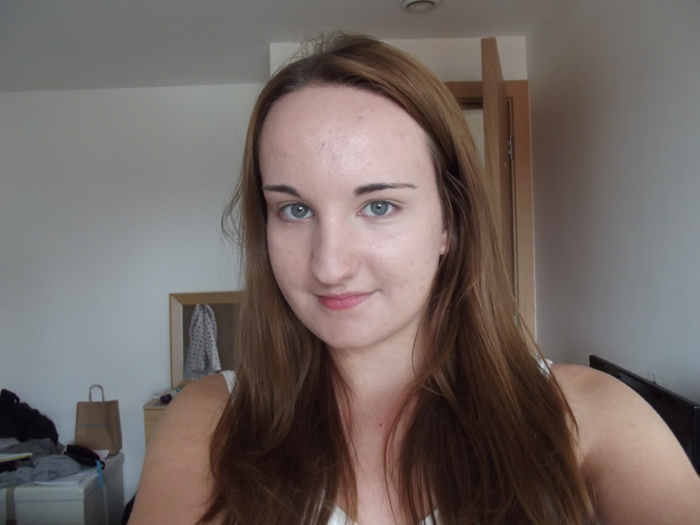 I find it difficult to make both eyes look the same, but I’ve found applying mascara makes mistakes look less obvious. The mascara I use is Soap and Glory Thick and Fast, available from Boots and Amazon.com. I first used this when I got a free sample in a skin care kit I got for Christmas one year. I love this mascara because it really highlights your lashes without looking fake. As the name suggests, it’s thick, and it also doesn’t smudge or run easily. I apply it generously to both my top and bottom lashes. I use a powder to set my foundation. I use No.7 Perfectly Bronzed Bronzing Pearls to set the foundation and to give myself the appearance of a light tan. I apply with a large brush, carefully dusting off any extra powder on my arm before applying to my face, just so it’s not so dark. This is available from Boots and Amazon.com. Finally, I apply my lipstick. I use Seventeen Mirror Shine Lipstick in the colour Belle. It’s so cute as it comes with a little mirror that slides out from the lid. It’s a really natural looking lipstick colour that makes your lips shine. This product is available from Boots but not from Amazon.com, so I’m not sure where you non-Brits could get it from. Sorry! And so here is the final product. 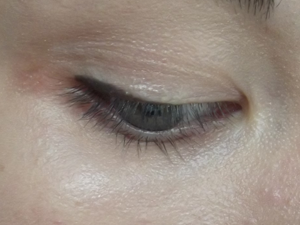 Of course, the spots are still visible but the redness has been reduced. It’s not perfect but it’s satisfactory, for me anyway. P.S. I know I have a wonky face, a huge forehead and Pete Townshend’s nose[1. This really isn’t an insult. I love Pete. ], but it really doesn’t bother me too much. I can sort the forehead out with a better hair cut (which I plan on doing when I get back from Italy), but I’d never have plastic surgery, even if I could afford it. Firsty, your eyebrows are GREAT! You do your make up really well! I am terrible at mine! I do love No7 stuff though, their primer and BB cream is the best I’ve ever used. I haven’t tried any Soap and Glory make up, but their skincare things are brilliant, and that mascara looks great on you! Have a great time in Italy! Why thank you. 🙂 I pluck them myself and I’m a little bit obsessed with getting them perfect. I haven’t tried any of the No7 creams but I’ve heard a lot of good things about them. Maybe I should treat myself. Oh that’s cool. I didn’t think you’d be able to get any of their products other than in the UK. Hehe thank you. 🙂 The foundation is great because it’s really light weight and feels like you are wearing none at all. I like this look by the way! It’s nice and natural. I tend to go pretty heavy with bronzers and blush these days because I like the way they shape my face….it’s bad for my skin, I know but I feel so naked without it all. I really like that lip color…too bad I’m not sure if I’ll ever be able to find it, hahaha. No problem. 😉 It was a great idea and I really enjoyed writing this post. I am impressed with how even and nice the coverage is with the foundation you’re using. Definitely not something that I can get here, but if it’s that light weight and if they have my colour, I’d go out of my way to find some just to try. I don’t think there is a single picture of me on the internet that wasn’t PSed or without makeup. Maybe I’ll gather up the courage to take some before and after pictures once I get into a skincare/makeup routine of my own! Right now, it’s sporadic and I’m still experimenting with products and looking for one that I really like. Aww thank you. 🙂 I feel really lucky to have blue eyes. This is the only foundation I have ever used and I would never change, just because it’s such great coverage.